Seven months ago I sent out my most recent Moment of Beauty, in which I mentioned my new-found passion for painting flowers, my deepening fascination with underwater scenes, my evolving aesthetics which embrace modernism and abstraction, and my collaborations with artist Nansi Bielanski. All of these things were still relatively new directions for me at that time, and now are becoming more and more the essence of who I am as an artist. Nansi and I have moved to a new home-studio in Newbury Park, abundant with birds, fish (in a pond) and Flowers Everywhere. So, fish, flowers, and birds continue to find their way onto our canvases, and we have also done some much deeper explorations into collaborative paintings, in which we take turns painting on one painting, sometimes even scribbling in unison side-by-side, in finding a way to express a shared vision which expresses the sum of our knowledge and experience as artists. This new method of working is both exciting and rewarding. 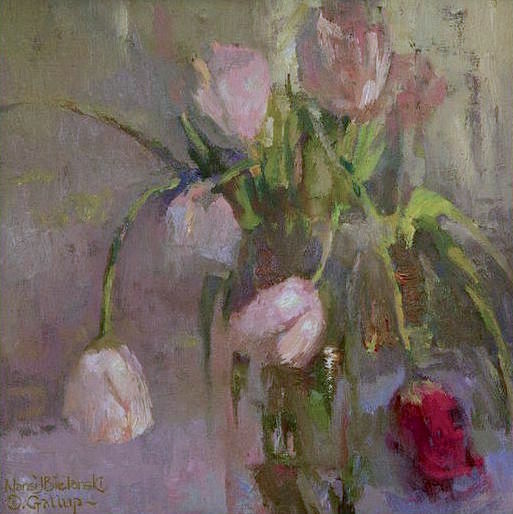 Our first major collaborative painting, "A Deeper Love" was exhibited at the California Art Club's 104th Annual Gold Medal Exhibition at the Fisher Museum at USC this year. 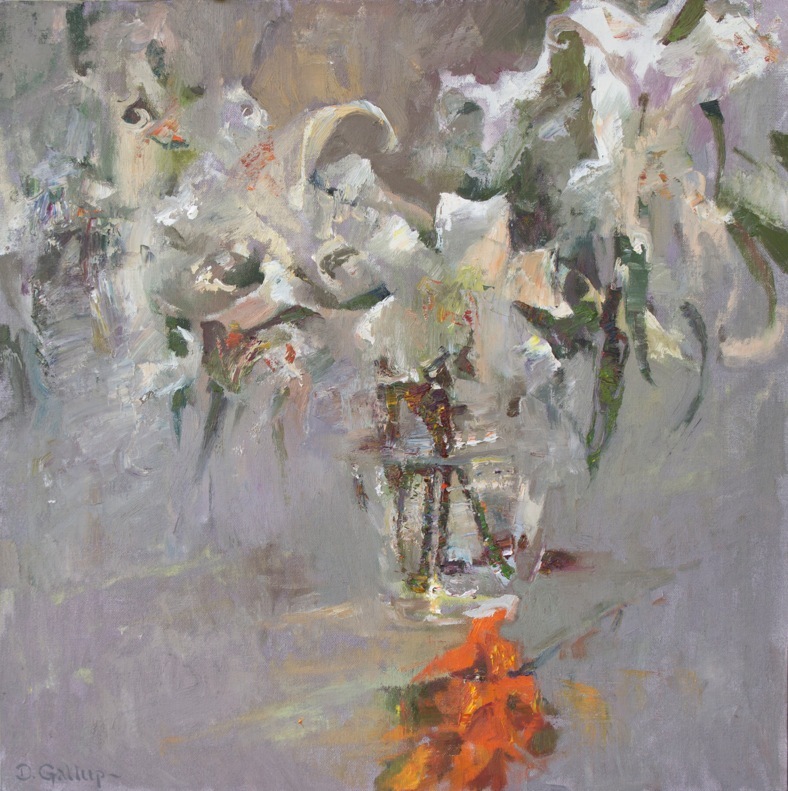 It sold on opening night, and received American Art Collector Magazine's Award for Artistic Excellence. In an exhibition featuring 180 juried paintings by some of today's most recognized artists, we were truly honored to be singled out for this award. Working with Nansi is thrilling, not only for the bold brushwork and color she brings to the canvas, but because of the way we have been working together on Concept. 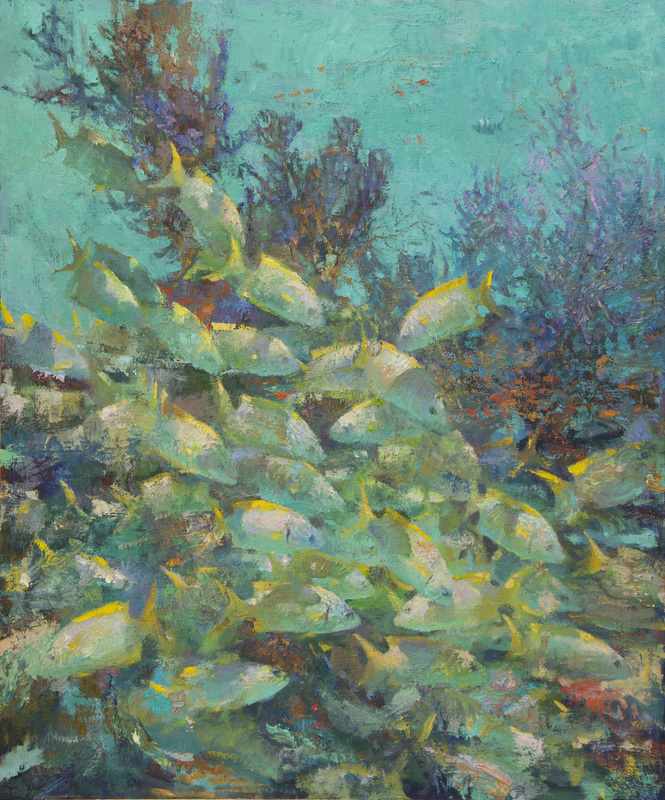 We spent seven months on this painting, not counting the time spent diving the tropical reefs of the Caribbean. Much of that time was spent discussing the idea of Experiential Painting (our new "ism", I suppose), in which we are attempting to bring to the canvas not an illustration of things below the water, but the feeling of the memory which lingers after the dive. How many fish were in that school you were swimming with? Nobody would be able to answer that after a dive, and we wanted to do a painting in which the viewer is equally unable to answer the question. To deepen the challenge, we wanted to incorporate motion and a passage of time into the piece. It has been the desire of artists for centuries to accomplish this, but few have had much success. The Cubists, in particular, were obsessed with the idea that "traditional" representations in Western art were mere icons, views of the subject from a fixed point in time and space, and sought to break free from that restraint. I suppose, then, that you could call our philosophy an outgrowth of a Cubist idea. 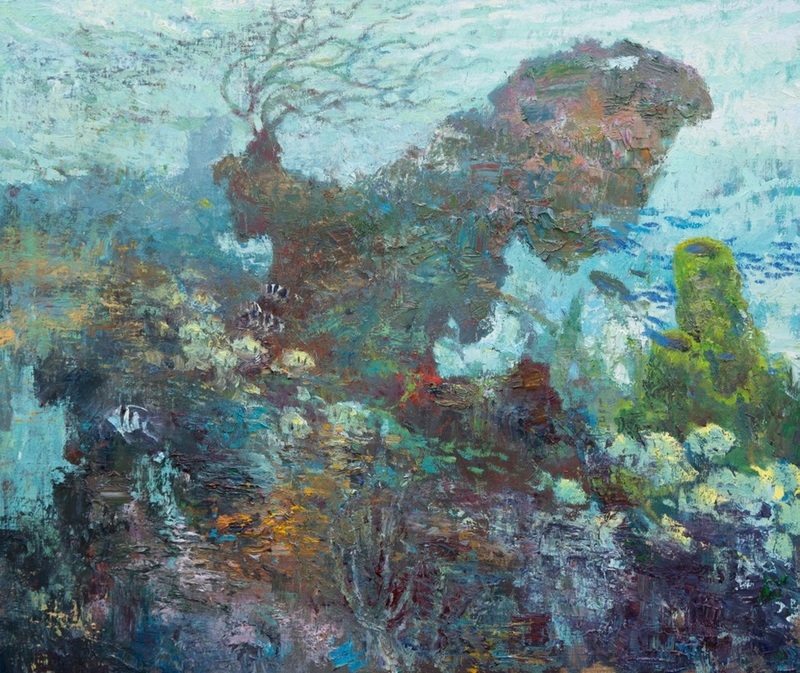 In this detail, you can see where fish and coral coexist simultaneously on the canvas, allowing the viewer to experience both the view of the coral, and then the fish in front of it, and then coral again before it once again becomes a fish, depending on the interpretation of the moment. Fish out-swim their stripes, and flickering light takes precedence over static form as motion trumps anatomy; memory trumps photography. The conversations between Nansi and myself which helped us to crystalize these ideas took place during the months that we collaborated on this painting, and have affected both of our personal painting philosophies and techniques. If I may brag about Nansi for a moment, she was named Guest Artist in Residence at the Carnegie Art Museum in Oxnard early this year. The honor allows her to use the Carnegie Art Museum Studio Gallery for her work, and for a solo exhibition of recent works. In addition to many of Nansi's beautiful paintings, she will be exhibiting several of our collaborative paintings in which we each contribute our own visions and abilities. The exhibit is currently being installed, with an opening reception for the artists on April 11 from 6-8 P.M. I hope we see you there. The CAM Studio Gallery is located at 329 N. 5th St., Oxnard, CA. Hours are Thursday - Saturday 11-5, Sunday 1-5. "Lazy Afternoon" is just one of the new collaborative florals and seascapes which will be on display at the CAM Studio Gallery on April 11. You will see that we are both finding ways to integrate boldness with harmony, drama with serenity, and looseness with naturalism. If you are interested in taking my "infamous" Color Theory Workshop (possibly the last time I'll offer it) in Carmel this July 7-10, please let me know. Email me at David@DGallup.Com for details. I am still offering a full list of classes at the new Studio in Newbury Park. Monday thru Wednesday is Master Class, with a Design Class on Thursdays. I hope you'll consider joining us for some super-charged learning this summer in a friendly, intimate environment. If you can't make it in person but want to learn more, check out all the free demos and videos on my website at www.dgallup.com. (Go to "more..." , then "Teaching Tools", then click the link "Videos" near the top of the page). I'm putting more videos up every week there and on my Facebook Page and Youtube Channel (search David Gallup Artist on either page). I love to hear your feedback and comments, and I hope to hear back from you and to see you soon as we travel together seeking out Moments of Beauty. Dear Friends, Collectors, and Art Enthusiasts~ It has been over a year since the last time I wrote a Moment of Beauty, and it has been a time of tremendous change in my life and in my work. An artist's work is a reflection of his inner state, a window into his life. It is said, in fact, that every painting is a self portrait. I am a private person, revealing myself in my work only grudgingly, but it is an inescapable aspect of being a fine artist that we share even that which we try to keep hidden. I will continue a tradition of sharing myself through my work while trying to keep my personal life personal, and let you, the viewer, watch my evolution in paint and find your own correlations to your own life. If it has been a while since you've seen my work, you will undoubtably notice some changes. In addition to a new website, there is a new style emerging in my work. It embraces more contemporary aesthetics, is looser, and has a more varied approach to paint application. As a teaching tool, I've been setting up floral still-life scenes in the studio for about a year. It is almost accidentally, then, that I have started painting florals and even become captivated by them. The opportunities for color, edges, design, etc. are all there, just as they are in any painting, and through my repeated exposure to the subject I'm developing a familiarity which is taking me to new places. What's more, I am finding similarities between soft corals and flowers which are undeniable, and the experience of painting these subjects is causing a cross-pollination, as one painting of a flower affects the next of a reef, and vice-versa. 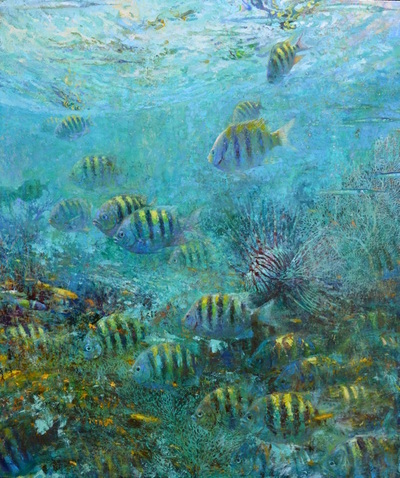 "Coral Head at West Caicos"
One thing which hasn't changed is that it is my love for the ocean which continues to inspire most of my work. Increasingly, however, this work is inspired by my experiences from underwater adventures, and this year I've had many incredible encounters beneath the sea which are only now finding their way to the canvas. "Coral Head at West Caicos" (above) is a piece which exemplifies the direction of my latest work, finding it's way delicately between abstraction and naturalism, swirling with color and motion and utilizing a bolder design element than most of my earlier work. 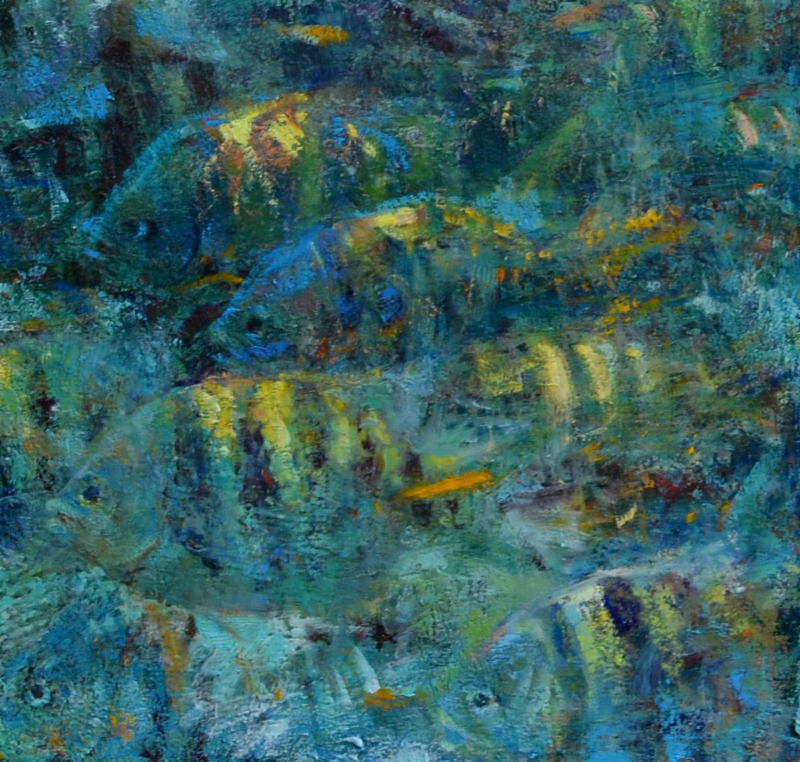 In this painting, paint becomes fish, and fish disappear into abstract areas of paint as I explore the ideas of depth of field and motion beneath the surface. For all of us who call ourselves artists, growth in our work comes from personal growth in our lives. Too often, it requires many solitary hours in the studio to translate our personal growth into something which helps us evolve in our work. This year, for me, the sting of that isolation has been soothed by the opportunity to collaborate on some undersea and studio pieces with another artist, Nansi Johnson Bielanski. Nansi and I have had the pleasure of painting and traveling together for a few years now, mainly in classes and workshops, and recently we have begun to weave our shared dive experiences into collaborative paintings in which we each contribute our memory of the scene, our interpretation of the experience, and our own artistic aesthetics and abilities to the work. Our most recent collaboration has produced a painting which pleases me more than any I've ever done alone, and maybe that should not be a surprise. After all, there seems to be little to risk in inviting in another trained eye, another broad mind, another set of talents and skills to add to the work. In"Jubilation", we have done exactly that, accomplishing (I believe) more together than either of us might have done alone. Between diving and painting trips, I continue to spend time with my two beautiful sons, and with a wonderful group of students, many of whom have become like family to me. "Color Theory 2.0: Brushwork and Palette"
This workshop will be limited to ten students (four spots remaining), and will be held in my studio in Camarillo each Wednesday in September from 11-4. In this class, we will examine the making of a great brushstroke, and define the elements which make some marks more successful or sophisticated than others, and students will learn to replicate some of the greatest brushstrokes in history (as defined by me, and by you) and apply those techniques to original paintings. Of course, brushwork is intimately connected to palette work, so we will be examining both. This workshop will be a great opportunity to study color with me if you have not done it before, and also will make a nice follow-up course for those of you who have attended the infamous Color Theory Workshop in the past. Cost is $600. I will try to get back into the habit of writing a monthly Moment of Beauty, and to write some supplemental thoughts on art on my Blog Page, at the newly re-designed DGallup.com. As always, I love to hear from you as we journey through life together seeking out Moments of Beauty. P.S. If you live anywhere near southern California, DO NOT MISS the Joaquin Sorolla exhibition running at the San Diego Museum of Art through August 26!!! It is the largest collection of his work in the U.S. since 1911, and demonstrates the strength of this artist who is still one of the most influential painters today, nearly a century after his death. If you live in Spain, just hold off for a bit, it's coming to you soon. With the days growing shorter and the heat of summer behind us, I couldn’t help throwing in a Malibu sunset to mark the end of the summer. For me, it seemed it was over before it had begun… a blurry memory of two growing kids zipping in and out of the studio as I worked and the lingering smell of baby sunblock seem to be all I have left of the whole season. I even find I’m missing the small paintings which tend to pile up around me during the summer, as I spent most of the season working on a few major works instead of nearly daily excursions to the islands or beaches in search of new subjects and inspirations as I’ve done in years past. It would be easy to see sunset paintings as merely an analogy to an end, or as looking back at memories, and there was a time I saw them that way myself. But with my decades of experiences mounting I now see that there is a power to that moment which isn’t so much signaling an end as it is celebrating the power of the elusive present. That power can be found in the special quality to the light which falls between day and night, not unlike the moment between past and future. The power of the present, of course, is that no matter how much we may reinterpret an event in the past or plan for our future, the present is the only time we can act to better the world. And though the twilight is fleeting, we are reminded that sunsets were here long before us, and will continue long after we’re gone. I always find comfort in the power of that continuity, as I suppose all souls do. You may recall my painting from last month’s Moment of Beauty, “Twice Humbled”. It’s now hanging at the Santa Barbara Maritime Museum. I went there a couple of weeks ago to supervise the installation, and was thrilled when the museum’s director showed me an original drawing by Whistler of Anacapa Island which is part of their permanent collection. It’s gorgeous, and if you’re there to see my painting you don’t want to leave without checking out this beautiful example of the greatness the islands have inspired. I’m told Whistler was commissioned to do this work by the US Geological Service, who fired him for including seagulls. Wow. I’m so fortunate that my sponsors at the National Park Service have never ventured an opinion on how my subjects should be presented! As I start looking forward to events where I might see you this fall, I’ve got a few dates you may want to mark on your calendars. First, I’ll be the featured artist at the California Art Club’s Collectors Circle Dinner on October 22. It has been rescheduled from September 10th as our hostess had an injury and needed time to recoup. Call the California Art Club if you’re interested in attending, at (626) 583-9009. I’ll also be teaching a workshop in Baton Rouge, Louisiana from October 28 – November 1. We always have a great time down there, and I look forward to seeing so many of you again. On October 24th I’ll be joining the Autry Museum at David Murdoch’s ranch to paint as part of the Masters of the American West & CAC Collector’s Circle paint-out. Though I live very near the ranch, this will be my first visit and I’m sure it will be a real treat to paint there. I’ll also be teaching my annual Malibu workshop from November 6th-8th (Friday thru Sunday). On Sunday, November 15th, I’ll be giving a talk on my Channel Islands paintings at the historic Blinn House in Pasadena from 1-3pm. I’ll be giving a power point presentation, and showing nearly all of the paintings which are completed so far for the upcoming museum tour. My annual Holiday Salon and Open Studio will be held on December 6th. As always, space will be limited to fifty guests so book your party early to ensure your plans. It’s going to be a busy fall, and I’m so pleased to know that I’ll be seeing so many of you at a rich variety of events- it’s always nice to abandon the solitary painter’s life for a day here and there to join with friends for a day of art appreciation, discussion, or creation.